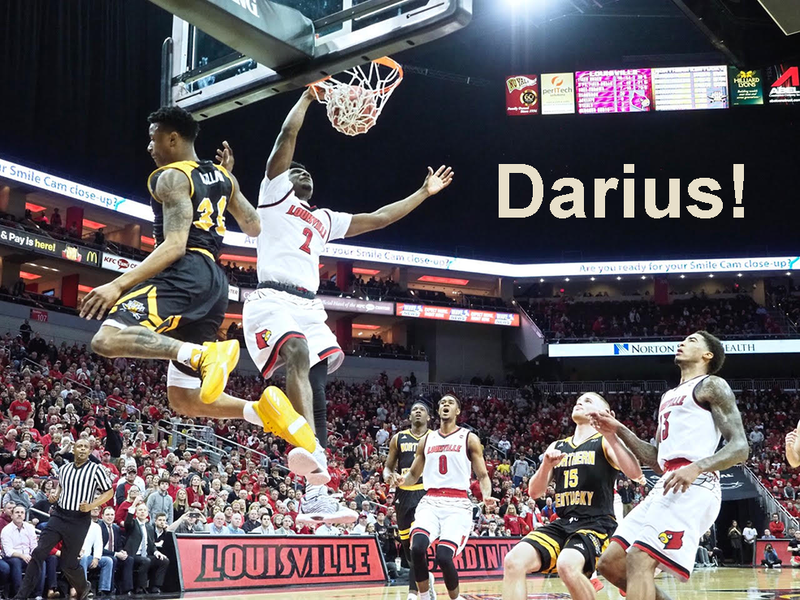 Darius Perry delivers the exclamation point and posterizing dunk in the fourth quarter in top photo. Below, Deng Adel collects two of his game-leading 20 points (Cindy Rice Shelton photos). Vince Tyra, the probable athletic director at the University of Louisville, had to have mixed feelings. Smallest crowd of the 2017-18 season but probably the best one. The crowd of 9,974 was full of fanatical Louisville fans having a great night out (Cindy Rice Shelton photo). The UofL partisans among the 9,974 fans so happy to be there for the National Invitation Tournament. Thriving on watching their Louisville basketball team. As one observer remarked, the home court would be a hell hole for opponents if every game had this atmosphere. 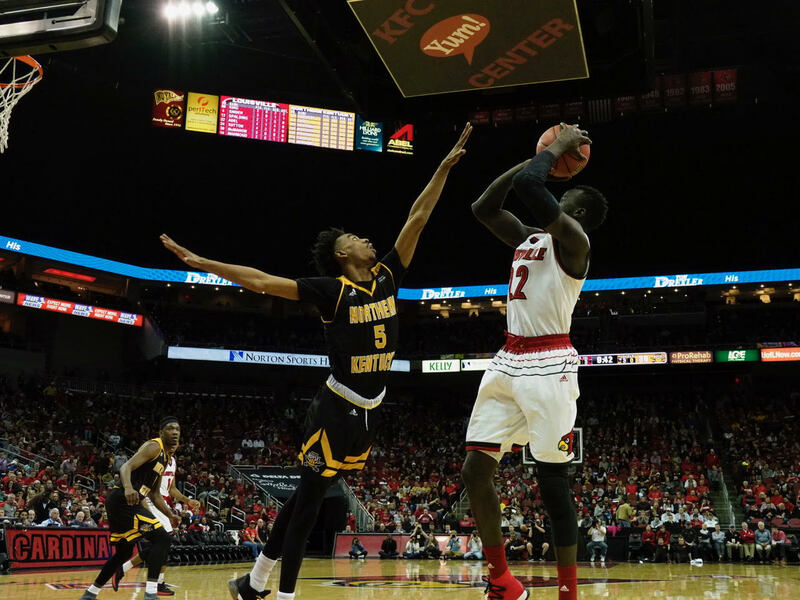 UofL was listless, awkward and struggling early, playing without any semblance of rhythm or purpose. Looking for a while like the Cardinals might be headed for still another low point, plunging into nothingness if they couldn’t get it going. So many airballs and blown plays, UofL falling behind 30-23 at the half. But this raucous congregation of fans, consisting of many never seen in the lower levels of the KFC Yum! Center, were not going to let them quit. They were there to see their Cardinals, enjoying the big buck seats, and they would be a factor. Time after time they willed the Cardinals back in the game, helping shake off the sluggishness, willing them back into the game, pushing them over the top. The crescendo coming with 40 seconds to go in the third quarter, on a towering, posterizing dunk by Darius Perry. The No. 1 dunk of the year coming in the NIT. The birthday boy from Powder Springs, Georgia, coming through with the icing on the cake. From that moment on it was just a matter of time, with Louisville a good Northern Kentucky team 66-58 to advance to the next round. Vince Tyra had to be amazed at the exuberance of the all the non season-ticket holders filling those seats in the lower bowl. In the best of all UofL worlds, the best seats would be always be occupied by the most vocal fans. Not that anyone is complaining about the regulars who have been there through some trying times. But crowds like the one Tuesday night are a endearing reminder of the yesteryears when economics were not such a dominating factor in college basketball. Coach David Padgett giving this crowd much of the credit, “They gave the energy we needed to win this game,” he said. One never knows what to expect with this particular University of Louisville basketball team. Nothing assured as long the game clock is running. The opposing team, not about to roll over, knowing there will always be a chance. Give these UofL players a decent lead, they will let up, get ahead of themselves, look ahead to the next round. The Cardinals racing to a 23-point lead with eleven and a half minutes in the second half. Florida State not rolling over, aware of Louisville’s recent history, using the adversity as motivation. The Seminoles would start making every shot, good, bad or indifferent, cutting the deficit to six points in the final minute. But the Cardinals would make five of their last six shots, Quentin Snider would hit both free throw attempts with 15 seconds to go. 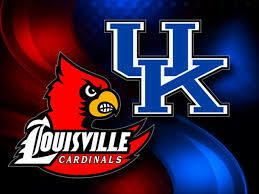 Louisville would hang on for a 82-74 win in the quarterfinals of the ACC tournament at the Barclay Center in Brooklyn. Snider, playing like time is running out on his collegiate career, playing with authority, trusting his 3-point shot, leading the way. Leading his team with 19 points, including three of seven behind the 3-point line, five rebounds and six assists. Deserving, perhaps earning a chance to play NCAA tournament ball his senior season. Ray Spalding, missing eight minutes with two fouls in the first half, providing a steady presence beneath the basket. Playing with confidence, wanting the ball, making those little hooks look smoother and easier of late. One wonders what if he had another season to work on them. Deng Adel playing a supporting role in this game. Laying off the dizzy-whiz stuff, passing the ball, getting eight rebounds and two assists, taking what the defense gives him, winding up with 15 points. Anas Mahmoud still missing those sure-thing, two-foot shots but blocking five Florida State shots, making six rebounds, three assists and a steal. Not bad but one still has to wonder what he would be doing had added some weight to his frame. Dwayne Sutton, making his case for more playing time when it counts, contributing 10 points and, notably, six rebounds and three blocks in 21 minutes. Hang on. Another Louisville-Virginia game this way comes. Somehow we missed the groundbreaking for the $40 million expansion of the Swain Student Activities Center at the University of Louisville at the end of August. Quite an undertaking. The expansion will provide students more than 112,000 square feet of additional or renovated dining, office, meeting and retail space. Including one of the first ever Amazon pickup stores. According to the Courier-Journal, funding includes nearly $10 million in university bonds, with the rest of the funding from student activities fees private donations and some University contributions. The last place anyone expected the University of Louisville to knock down 12 of 18 three-point attempts would have been at Cassell Coliseum in southwest Virginia. Couldn’t have happened at a better place, UofL would need almost every one of them to outlast Virginia Tech 91-83. One of those seasons when one never knows which UofL player is going to take over a game. A different player or combination of players every game. A healthy indicator for any team that wants to be among the serious contenders in March on a team coached by Rick Pitino. No better time for Damion Lee and Trey Lewis to reassert themselves as the leaders on this team, the two post-graduate scholars conducting a shooting clinic. Most of the three-point baskets seeming to come when Virginia Tech had come within striking distance, the Hokies refusing to roll over time after time. Scratching and clawing their way back in the game down to the final 20 seconds. So much for Chinanu Onuaku’s six straight double-double games. The Hokies got him in foul trouble early, just as Pitino had predicted they would. Any time a Virginia Tech player got close to Onuaku, the whistles were instantaneous, as if there were some sort of bounty to be collected. Anas Mahmoud came back down to earth in this game, managing only four points. Give Mahmoud credit, however, for three early blocks that put an end to Virginia Tech’s early dominance. The Hokies raced out to a 20-12 lead before Mahmoud started plugging up the middle. He would have some defensive lapses later, but he helped his team turn a crucial corner. As well as Damion Lee and Trey Lewis were playing, Louisville also had to have Jaylen Johnson’s best game in a Louisville uniform. Johnson would score 11 points, including one 3-pointer, and he have nine rebounds, three assists and a block. Fortunately, he was able to return to the floor after twisting his elbow backwards near the end of the game. Damion Lee would hit six of seven three-points attempts and 11 of 12 free throw attempts to lead all scorers with 29 points. Trey Lewis would score 20 of his 22 points, including all four of his three-pointers, in the second half. With the win, Louisville moves to 6-1 in the Atlantic Coast Conference. Next up is Virginia on Saturday, and North Carolina on Monday. Going to be fun seeing who emerges in those games.